The Promenade Round Cocktail Table by Hammary at AHFA in the area. Product availability may vary. Contact us for the most current availability on this product. Wood & Finish Unique finishes include Antique Linen, Fruitwood and Sage. Handles & Hardware Antique pewter hardware on select pieces. Case Detail Bracketed legs and wood slat shelves. Other intricate details include dentil molding, bead board backs, cantilevered moldings, band saw cabriole legs and two-toned finishes. Everything about the luxurious "Promenade" collection is big - the sweeping dimensions, the ambitious design, the abundance of fine materials. But nothing is bigger than the idea behind this trend-setting group: That furniture should breathe life into a home and speak volumes about its owner. This delightful new collection was inspired by Flamant Interiors, a trendy European decorating and furnishing retailer. Crafted from deluxe pine solids and birch veneers, each piece has been handcrafted and built on a large scale to complement today's high-ceiling homes. 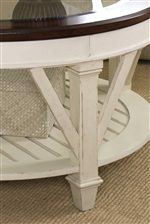 Whispers of French, Scandinavian, English and Italian influences can be found throughout, from the antique pewter hardware on select pieces to the bracketed legs and wood slat shelves. 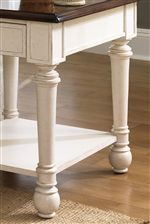 Other intricate details include cantilevered moldings, band saw cabriole legs and two-toned finishes. This eclectic group includes a useful selection of occasional pieces. What does your furniture say about you? What would you like it to say? If you answered smart, stylish and sophisticated, then this is the group for you. "Promenade" from Hammary. Live large! 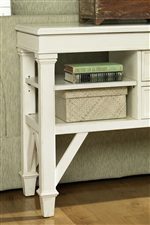 The Promenade collection is a great option if you are looking for Traditional furniture in the area. Browse other items in the Promenade collection from AHFA in the area.